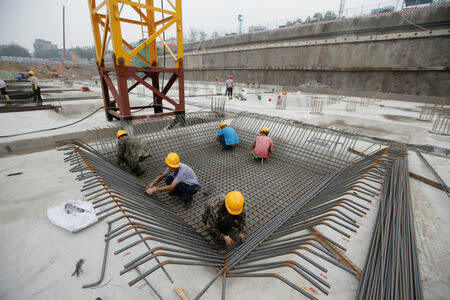 BEIJING (Reuters) - China plans to set a lower economic growth target of 6-6.5 percent in 2019 compared with last year's target of "around" 6.5 percent, policy sources told Reuters, as Beijing gears up to cope with higher U.S. tariffs and weakening domestic demand. The proposed target, to be unveiled at the annual parliamentary session in March, was endorsed by top leaders at the annual closed-door Central Economic Work Conference in mid-December, according to four sources with knowledge of the meeting's outcome. "It's very difficult for growth to exceed 6.5 percent (this year), and there could be trouble if growth dips below 6 percent," said one source who requested anonymity due to the sensitivity of the matter. As the world's second-largest economy loses steam, China's top leaders are closely watching employment levels as factories could be forced to shed workers amid a trade war with the United States, despite a more resilient services sector, policy insiders said. 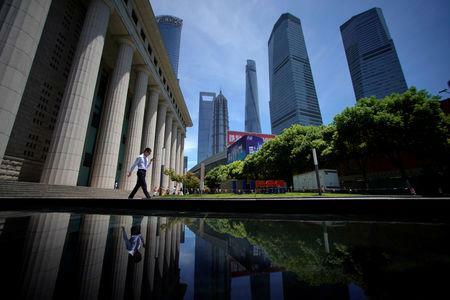 Growth of about 6.2 percent is needed in the next two years to meet the ruling Communist Party's longstanding goal of doubling gross domestic product and incomes in the decade to 2020, and to turn China into a "modestly prosperous" nation. "Considering employment, income and stability, we need growth of at least 6 percent this year," said one of the sources. Data this week showed China's consumer inflation eased to 1.9 percent in December from 2.2 percent in November, below the government's full-year target. Chinese leaders have turned more pro-growth since the December meeting, softening a drive to rein in financial and debt risks, but they have ruled out "flood-like" stimulus. "The pressure on the economy is quite big, and overall policy focus is stability this year and even next year," said one of the sources. The central bank is likely to pump out more cash by further lowering banks' reserve requirements, following a broad-based cut this month, while trying to funnel more credit to small and private firms - vital for growth and jobs, policy sources said. Policymakers remain reluctant to cut benchmark interest rates despite easing pressure on the yuan, fearing any moves could spur capital outflows as China's short-term bond yields have fallen below those of the United States, they said. The annual budget deficit could rise from last year's 2.6 percent of gross domestic product, but is likely to be kept below 3 percent, the sources said without giving specific figures.